South Brunswick Police are looking for the public's assistance in identifying a male who was peering into residences and vehicles on Major Road. On Saturday August 11th at 6:35am a black male can be seen on surveillance footage parking in the driveway of a residence on Major Road. The suspect exits his vehicle and begins to look into the window of a parked car in the driveway. The suspect can later be seen on surveillance footage at a neighbor’s residence on Major Road. In that incident the suspect looks into a rear slider door window and then walks around the residence to the front door and checks to see if it was unlocked. 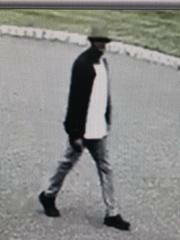 Suspect Info – Thin black male wearing a grey hat, black jacket, white shirt, blue jeans, and black shoes. 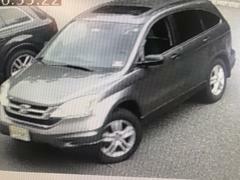 Suspect Vehicle – Newer model tan/or silver colored Honda CRV. 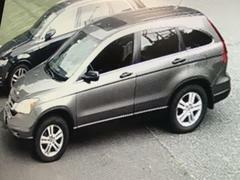 See the attached pictures of the suspect and suspect vehicle for further details. Anyone with information on the suspect is asked to call Detective Dennis Yuhasz (732) 329-4000 ext. 7485. In order to reduce the number of nuisance and vector mosquitoes in the specified area(s), the following adult mosquito control products will be applied from the ground by truck, handheld equipment, and/or by aircraft, using low volume (LV) or ultra-low volume (ULV) techniques: Sumithrin/Prallethrin (Duet®), Deltamethrin (Deltagard®), Malathion (Fyfanon® ULV Mosquito), Etofenprox (Zenivex® E4 RTU). Pay attention to notices about spraying found through newspapers, websites, automated telephone messages or notices distributed by municipal, county or state agencies. Plan your activities to limit time spent outside during times of possible insecticide treatments. Move your pets, their food, and water dishes inside during ULV application. Also bring clothing and children’s toys inside. Stay away from application equipment, whether in use or not. Whenever possible, remain indoors with windows closed and with window air conditioners on non-vent (closed to the outside air) and window fans turned off during spraying. Avoid direct contact with surfaces that are still wet from pesticide spraying. Do not allow children to play in areas that have been sprayed until they have completely dried (approximately one hour). If you must remain outdoors, avoid eye and skin contact with the spray. If you get spray in your eyes or on your skin, immediately flush and rinse with water. The Commission has notified municipal officials, health officers and police of these plans. Neither the USEPA nor NJ Department of Environmental Protection (NJDEP) requires relocating or taking special precautions during spraying with this product. All applications will be according to product labeling. If residents wish further information, they can contact their local health department or call the National Pesticide Information Center 1.800.858.7378 or visit their website at the following link: http://npic.orst.edu. The Commission (732-549-0665) operates a message machine 24 hours a day/7 days a week for individuals who cannot call during our working hours, 7:00 AM to 3:30 PM. Please Note: Treatments for adult mosquitos will be done on streets on a limited and localized basis within the specified area(s). Treatment time for a specific street is not possible (Rain date-mostly next day). If the conditions are not ideal, the treatment will not be conducted. Follow the South Brunswick PD on Twitter @SoBrunswickPD for additional videos, pictures, and updates.